As my wagon approaches 190K miles I began to think that it would be worth doing a thorough refresh on the rear suspension. My Öhlins shocks have about 70K miles on them and they appear to be perfectly fine so they will simply get a pair of new shock mounts for good measure. I'm more concerned about the bushings...and there are a lot of them! Much of the original groundwork for this thread was done by Neu and I'm very thankful for the research he did a while back. I was going to wait until I had a bit more information and had the project more or less done but I'm posting now in the hopes that we can pool resources and try to figure out a few more of the missing pieces. I started by getting a used but reasonably clean spare rear subframe and having the bushings removed by the excellent (and refreshingly honest) machine shop I use in Tucson. The next step will be to clean it up and then have it powder coated. 9140469 (#2 in diagram) - this one is normally cracked apart by this point in time and in need of replacement. Volvo basically went into their parts bin from the 700/900 IRS equipped cars. In some cases, Volvo used different part numbers in the RWD cars but the bushings remain the same. 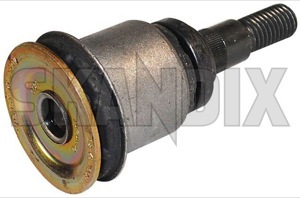 For example, bushing #3a appears all over the place in Volvo RWD suspension. In fact, on the old bushings that were pressed out, the rubber is stamped with the corresponding RWD part number (1273235) and another bushing actually must have literally been sitting around for Volvos in the 80s because it had “West Germany” stamped onto it. The good news is that bushing 3a is available in poly from Superpro/Superflex as kit SPF2012K for the RWD cars. The bad news is that the other 2 sets of bushings, though common on the RWD cars, are not available in poly from anyone. I would really like to have these manufactured but we would need to get a bunch of people together to convince a company to do a run of these. I can supply a company like Superflex or Powerflex with the original Volvo bushings. The next part of my rebuild involves the upper control arms (#6) and stays (#15). I found a set of each in Sweden that had about 100 miles on them and had them glass beaded. *The original rubber bushing needs to be burned out so be prepared to repaint the bracket. Mystery Bushing - not available as a separate part from Volvo. This bushing has bolt #14 in the diagram going through it. Neubar and his friend Howard have tried without luck to find out what this bushing is. The part number stamped on the actual bushing does not correspond to any Volvo part number though it does have the correct number of digits. From what I could read it said "Made in Germany" and either 9157319 or 9157318. It would be great if we could figure this out. The track arms (#25), also called stays by Volvo, on my car are very rusty. I had once before painted them with some Rustoleum but I always wanted to replace them. I found a rust-free set from someone parting his R in California and had the machine shop swap in new bushings (#26 & 27). Apparently the outer bushing has a separate part # for XCs which is cheaper and I believe some folks here compared the bushings and there is no difference. 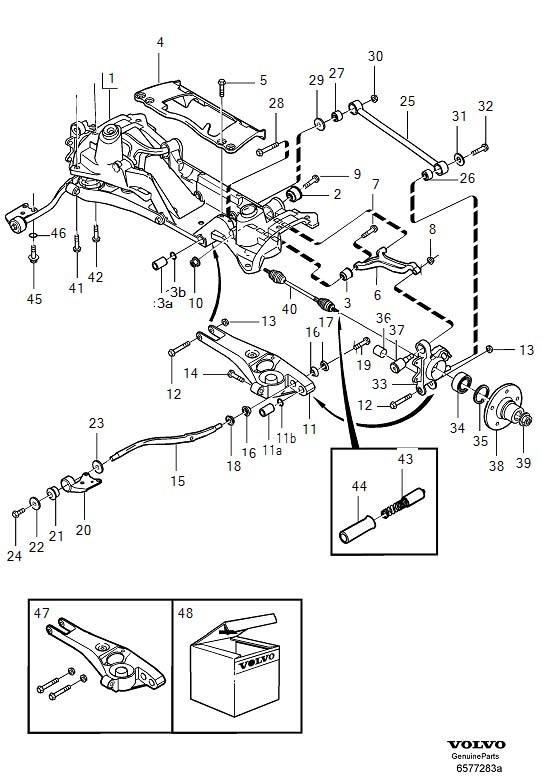 If you buy the complete track arm from Volvo there is also a separate part number for XCs which costs half the price. I would go that route if you are buying them new as they should fit. In fact, Volvo has discontinued the track arms, non XC bushing and also the hub bearing bracket part numbers for non XCs which would add further evidence that there was never a functional difference. In Sweden, I found a brand new rear axle and a 2nd one with low miles but that was rusty. This has since been cleaned up but I'm struggling to find a boot kit for it. Does anyone know if one is made? Volvo does not list any kit for the rear axles and after it was glass beaded it surely needs to be re-greased and re-booted. I had also picked up a spare rear diff in Sweden with ~500 miles on it that was used on an 850 AWD for a tech school repair course. The car was basically worked on by the students as a new car and then taken to the dismantler. This diff sat on a shelf for about 15 years forgotten. I've had the machine shop drill a small drain hole in the casing to make service easier. This required some work to figure out where it would be accessible given the way the subframe basically surrounds the diff but I think we figured out a spot that will work. I'll take pictures of it the next time I'm in the States. This project has been a long time in collecting parts but I'd like to do it once and do it right. I would greatly appreciate any help tracking down the mystery bushing, a boot kit for the rear axle that would work and would love to work on some kind of group buy to convince someone to make those other 2 sets of subframe bushings in poly. Happy to coordinate, get in touch with manufacturers etc. Hope this information can help some people who are thinking of revamping the bushings on the AWDs. I'll continue to update as work is completed but it will be slow. I also forgot to mention that at this stage it's probably a good idea to replace #37 in the diagram. You know, you can be a real jerk, Will. Here I was, enjoying a 3-day weekend, having a beer, watching my boys play in the yard... And then I see this. And now I am reminded of exactly what I've been putting off thinking about for years. Seriously, everyone on this forum owes you a frosty cold pint of beer. Tremendously concise, thorough explanation and breakdown of the rear suspension bushings. Above and beyond with the part numbers and application cross-over information you provided. When I'm back at work next week I'll see what I can do about tracking down some of the missing mystery pieces and also do my best to inquire about working with our vendors in regard to poly substitutes. I know Brandon! Will sends me these photos last week and my jaw was on the floor! Funny thing I was thinking of polishing my lower control arms..
As I told Will this info about the poly bushing Superpro as SPF2012K couldn't have tome at a better time, some of mine are dead and need to go soon. The LCA mystery bushing... 9157319 or 9157318, I'll see if Howard can track down anything with these #s. I've got used low mileage XC LCA that I'm using. Now the toerods, or trackstays, IIRC the XC bushing and AWD bushing were different cause of the XC ride height. I thought they had different bushings to account for the different range in tow. I had CJ ajustable toe rods on mine before my bushings started to go, I may add those back into the mix with new poly. Thanks Will, and keep this post updated with your progress! I swear you're reading my mind here Will! After talking with Neubar at Carlisle about the rear bushings in his car, I am seriously contemplating acquiring a spare subframe to work on rebuilding and improving upon. You've done an awesome job of collecting and organizing a tremendous amount of information in such a concise manner :tup: This thread should be stickied for permanent reference! If you can measure the dimensions of the "mystery bushing" on the lower arms, it may be possible to find or adapt a generic/universal bushing to work for our need. Interests:Vintage GI Joe/ActionMan, Volvo mods, Mountain biking, Family! This came up for me a few days ago when an SS memebr pm'd me about the process - I still haven't touched mine either, and now with 175K miles, it's about time I started in ernest also. Don't want to wait until something breaks. I have only collected the new track arms, the stay "bucket" bushings (as they were known for 240 series application) and the 700 caster rod bushes at the rear end of the stay - I bought these from IPD in poly form. Truthfully though, you all know how much I appreciate the Volvo community and the friends I've made in it over the past decade so I hope I can occasionally give back and with some luck we can get enough people together to get a supplier to take us seriously enough to make some bushings. Andy - I should have made measurements of the bushing over Easter when I was in the States. Perhaps someone who picks up a spare set of LCAs can do so in my absence. H - Very interesting on that part number you gave. I will ask my contacts in Sweden if that's possible to obtain here in Europe and what's in it. Good that you got those bushings from IPD as the ones Neu and I got made by Daystar don't look particularly high quality and just from hand fitting them as a test I was skeptical that they would fit nicely. I think the IPD version is from Super Pro...but FCP had a special on the Daystar ones for about $4.25 I'll get a Super Pro set the next time I'm in the States and can work on this a bit further. Also, does anyone know if there is a boot kit made for the rear axles by anyone? After glass beading the one axle I would be very skeptical that the old boot should be reused. The "screw kit" #8628965 should contain every single bolt and nut. It is still available in the EU. From what I understand it is more of a convenience package to purchase everything at once instead of having to order 20 different parts numbers. My dealer showed me that all the screws, bolts and nuts are sublisted under this parts number. Please note that Volvo recommends using new bolts only. Part #16 aka #6819057 is also lifted from the RWD cars, 740 and 760 cars with alloy control arms. OEM manufacturer is MEYELE and the bushings can be had for 12€ a piece which is roughly 1/3 of the blue boxed item. Bushing #9490797 should also fit. Keep in mind that Volvo did a lot of test runs of options on the P80 cars. Integrated carphone, RTI, adjustible suspension and so on. Many of these parts where also used on the early S80. The backup sensors for example are a direct fit, in fact the entire kit is listed for both cars. Simply put the part number is not important, wether or not it fits is important. I think this might have happend: Volvo developed parts for the 850 AWD and paid someone to develop that bushing. When they were developing the P2X platform they saved money by using the exact same bushing. However they don't want customers to save a couple of $$$ by buying the bushing instead of the new control arm, so they changed the part number. Biggest problem I've found so far lies with the upper subframe. Short version: The subframe is a "broken" clamshell design. The differential is sandwhiched between the upper subframe and the lower subframe but not bolted to any of them. It merely rests on its rubber bushings. Both subframe parts are bolted together. When taking apart my used rear axle, most bolts where rusted but could be removed using penetrating fluid and a rattle gun. None snapped of, but not all came out easily. However, both subframes are cast alloy, but all bolts are steel. And that is a problem. Some of those bolts were impossible to get out because you can't reach them with a rattle gun as there isn't enough space. For example the fuel filter bracket has one of those bolts, but that can be resolved. What annoyed me a lot more was the fact the when I went to remove the 3 bolts that hold the expansion tank in place, one snapped of and took the mounting point with it, one took the mounting point with it but came out in one piece. Didn't try the third bolt. The drama comes when you realise that the mounting points are part of the upper subframe and not a spacer as originally thought. The expansion tank is made of plastic and sandwhiched between the mounting bolt and the raised mounting point. Think of the mounting point as a leg, ~5cm high, ~2cm in diameter. This leg is directly part of the casting, so whe you snap it of you have to buy a new upper subframe. Sadly this will happen to everybody not living in a dry climate. Once water starts to seep in the small space between tank and mounting point, the bolt will slowly start to corode. During corosion it will expand, cracked the the mounting point. All is fine, until you remove the bolt or the car hits a big pothole. I've got no idea how to remedy the problem. A space might work, but that would mean machining the broken mounting points which are all irregular. Said space also might be a safety hazard, as the forces exerted onto the bolt might make it snap of at the bottom. Also why use PU bushings for everything? I can't imagine it being very comfortable. Big Will: Tell me more about the custom differential drain hole. The expansion tank mounting points seem to be spacers and not part of the upper subframe. Haven't found a parts number for these spacers so they are probably sold together with the expansion tank. Has anyone ever had to replace that part and can confirm my theorie? Interesting info about the screw kit. There are a ton of screws so depending on the price it could be worth it but if it doesn't include any bushings then I'm less inclined. A few people are working on the mystery bushing in the LCA which is great. Hopefully we'll have some answers soon. If we can't find an exact Volvo part then perhaps with the numbers on the bushing we can go to Lemfoerder or Meyle and figure out if they stock them. As for the poly bushings for the subframe, I think it would be nice to have a sportier response from the suspension and am in favor of trying poly. Probably something like delrin or other plastic bushings would be far too stiff and would add unwanted vibration. As for the differential drain, I spent some time with the owner of the machine shop looking at the spare subframe and the diff and we decided that a small drain hole in the back of the casing could work as long as it was done in a way that would allow a small tool to access it. IIRC, they capped it with a small plug that can be unscrewed using a hex key. In order to do this they unbolted the back of the case so there would be no metal shavings left inside. This was $25 very well spent in my opinion. I may have a small pipe installed that can be capped off with a bolt which would come out from the drain toward the passenger side of the car to make the process extremely easy but the shop didn't have anything to do that on hand. Sorry been busy with work travel. Howard came up with zero for both those # on his master online search at his dealership. He's got no other cars that he can cross reference them too. Poly bushings are stiffer, and my transmitt viberation and noise. But the flex less and don't deform like rubber under loads. I had a 245 with all poly suspension bushings (and other bits) and it was amazing to drive, and fairly comfortable, on a 9hr drive from DC to Indy my friend commented how nice it was. Not harsh. But the roads really depend on how much you'll like them. I love a stiff suspension car so I'm in favor of them. Also poly are easy to replace once you torched out the old oem bushings. Delrin and aluminum bushing will be noisier and transmitt a lot of vibration. My delrin subframe bushings are brutal but I love them. I am in the process of renewing the rear suspension on a 98 V70XC. it appears that the v70r and XC rear subframe components are common. I want to replace al least the dynamic bushings for the upper and lower control arms and the stays,#15. I see that sources have been identified for most of these bushings. Haven't found a spare subframe to work with so working with the one I have. Was the bead blasting The question is that if poly options are not available for all locations would it be better to go with all OEM or is there a combination that would be optimal? On a related note when the subframe is dropped what fuel or other related components such as the pump and related lines should be replaced when access is at it's best? Will continue to follow the topic. Tks for all the research that has been done by those who are ahead of me in this process. I'm going to be watching this thread closely-both the 2000 V70R I just bought and my '98 XC (which just passed 240K) could use some refreshing in the rear suspension. Just an edit from my original post. Part number 6819057 (#16 in diagram) was pn: 1359599 on the 7 series and is available in poly from Skandix and some other vendors. I recently bought the IPD version of bushing #16 (8K0058), but haven't tried it yet. I've tried the FCP version and it won't work without modification. I have a feeling most of them won't work without some work. I've also ordered 2 sets SuperPro SPF2012K. I've been thinking if I just cut and torch out the old rubber and leave the sleeve still pressed into the frame that I may just be able to get away with just using the poly and inner sleeve. I know pressing out or cutting out that sleeve is not going to be easy and make more headaches then I need.. I may try my extra pair of LCA first then tackle the subframe. I haven't tackled this project in its entirety yet as this past month while I was in the U.S. Ben and I did a build on my motor (I'll do a thread detailing that soon as soon as I get a few remaining photos from Ben). The next project will be the rear suspension but having an extra set of all the rear suspension parts makes things so much easier. I chose to have a local machine shop press out all the bushings on the spare subframe and LCAs...very little cost that saved a lot of headache in my view and now the parts are ready for paint. I completely agree on the FCP poly version of #16. It looks like an awful quality bushing so I think I'll stick with the Volvo ones for that spot. I spoke with Ben Kaplan about possibly making a spherical bearing insert for that non-existent LCA bushing and he's confident he can make some. Perhaps we can get a group buy together as I'm sure there are 5 of us that would go for a set. There are also those other 2 sets of subframe bushings that appear to be available only as rubber (#s 2 and 3 in the diagram). Bushing #3 seems pretty robust but #2 is a pretty weak one in my view. Ugh... If it were anyone else other than Ben Kaplan I'd be interested... I (and others) have had issues dealing with him on the internet and in person. Since he's local to me (15mins away) I see him often enough to know I'd rather work with someone else. Case in point is when he was looking for a local guinea pig for his AWD coilovers, that's a good read if you look for the thread on here. Plus I think bearings are a bit overkill. Delrin or aluminum bushing be better and lower maintenance. I don't think that bushing flexes that much to require that much movement. I see a lot of Bens work uses bearing and that's screams 1) $$$ and 2) replacing it sooner, especially since it's right next to the rear wheel that thing is gonna get hit with every you drive thru. Nice thing about delrin and aluminum is anyone can machine them, cheaply. And if you are looking to make your rear suspension stiffer with poly, getting materials that flex less will help. The problem I'm going to have with pressing out the #3a LCA inner bushing sleeve is that I'm not going to be able to do it while the it's off the car on a hydraulic press which is easy. I'm working with it still on and pressing them out is more then likely not an option. I'd have to use a "C" clamps style which might not cut it. So if I can reuse the OEM sleeve and for the poly that's a step I avoid. Cutting/torching out the old rubber is a easy as I've done that on my old 245 rear axle while it was still on the car. I even made a little heat shield and had a spray bottle of water just incase things got too hot, which they didn't... You just have to do it in a well ventilated garage... That's what I did for bushing #21, left the sleeve and reused it with the poly. Actually FCP version of #16 doesn't look too bad and there Poly is much better than IPD (IPD uses poly that's soft, all my blue bushing/mounts etc. made of it turns to gum) FCP uses a harder poly it's just the design is a bit thicker/wider then the OEM design and could use some trimming to work maybe. This could also be the case for IPD's I haven't test fit them yet. I've had bushing #2 replaced. It has large open areas that allow it to flex and tear and from what I've read the 960 guys don't like them either. That sounds like a good candidate for poly replacement, not sure why nobody make them. And I'm going to eventfully do #37 when I get everything else done. I am so in on this thread! Thanks Will for sending me this link. I'm pulling my rear subframe apart as you read this. Already ordered bushing #'s 3a, 11a, 21 and 16 from IPD. Then I saw that Will corrected the part number on 16, so I'll just return that one and get the correct one from FCP, along with the mystery bushing on bolt #14. I plan on having some of the missing bushings in either Delrin or aluminum. I'm with NEU... don't want to spend an arm and a leg to have someone make bearing-based bushings which will wear out faster than something more solid. I think bushings #2 and #3 can be Delrin. Update: I bought bushing #16 through FCP. Was $21.95 Superpro number 6819057. You will need two kits. Tried going through Skandix, and the bushing set was 57 Euro ($71 USD), and shipping was 64 Euro... screw that! I hadn't seen that FCP is now offering bushing #16 from Super Pro. The set that I bought from them came with 2 sets of bushings and was made by a company called DayStar and cost about $7 on clearance...it looks like pretty bad quality. I'll just get the Super Pro set the next time I'm in the States...shipping from Skandix here in Germany to the U.S. is absurd because they use a flat rate up to certain weights. Let me know if you have luck making some delrin bushings for spots 2 and 3. So for my upper control arms bushing, I've had them replaced already they were fairly worn especially the rear bushings were slit at the rubber gusset. My plan to upgrade them was since they are on the car was to just use 3M Window Weld caulk to fill in the voids on the bushings. I've used this for my motor mounts that I can't get in poly too. The procedure of applying is a bit time consuming depending on how you do it. I also used fresh rubber that was cleaned of casing oils and applied thin coats over several days. The rears are easy to caulk while they are on the car too. NEU, I've been in touch with Will via PM about this, and I've been working on some alternatives to the factory bushings. Using the information Will had posted, I gathered up all the necessary poly, and pressed out all the OE bushings. More importantly, I have the subframe and upper control arms at my machinist's shop and he plans to do some kind of Delrin bushing with steel inserts to replace bushings #2 and #3. ASFAIK, the upper control arm is just a pivot point, and doesn't experience any lateral forces, so Delrin with steel inserts to serve as mounting points for the control arm. I ordered two, and did some measuring. There's a slight difference in the center steel insert length... 2mm. Luckily, that difference is on the short side, where the bolt enters the bushing. The bushing itself is slightly different in length, but that shouldn't be a problem either, as it can be driven into the LCA to a point where it correctly attaches to the control arm stay. Will has suggested that this mystery bushing be replaced with either poly or something else. My concern is that this bushing DOES receive lateral forces and so whatever replaces it has to be strong enough to handle that. This MIGHT be a good place for some kind of spherical bearing, though wear might be an issue if all it sees is lateral force. I'm going to look into some kind of poly replacement, but not having any kind of catalog that shows bushing dimensions is going to make that like searching for a needle in a haystack. My other concern is that poly tends to "hog out" quicker than rubber when subjected to lateral forces. All I can say on this one is "stay tuned". If I can figure out how to post pictures to this revamped forum, I'll post up some pics I've been taking of the progress. Nick, it seems to me that the "mystery bushing" could be machined out of delrin. I can't imagine that wear would be much of an issue as the bushing shouldn't see much force because it is used as a locating mount for the lower control arm stays, and has very limited range of travel. If delrin is unacceptable for that application, a generic poly bushing (for example from Energy Suspension's universal bushing catalog) could be used with an external steel sleeve to allow the poly bushing to sit tightly into the lower control arm opening; much like the upper engine mount bushing. Still working these, but getting close. My machinist was waiting on materials last week, so this week he should be machining the bushings. Will post pics when they're done. Just a heads up, the "bolt kit" has been discontinued. Rear brake shields have been discontinued for all AWD models, splash covers completely for the 1997 and 1998 AWD, one side for the '99 and '00 AWD.